DUG Insight User ManualFrequently Asked QuestionsFrequently Asked Questions VelocityHow can I create a simple velocity model for 2D data? A velocity model can be constructed using Volume Maths (see Volume Maths). While the equation may be a little daunting, the result is very flexible. For 2D data, we will use stack data to define the output lines. In the Process tab, click on the Add icon and select New Process. Create a Volume Maths process and type a Name for the process. In the Details Panel, click the Add icon to add your 2D volume and horizon. The process should now yield a resulting volume in the Volume tab. 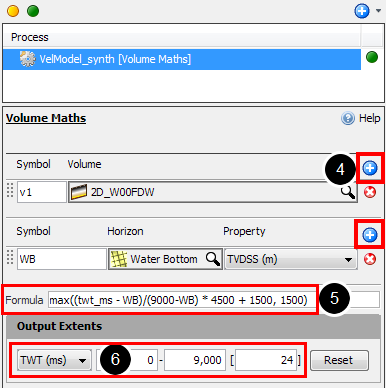 Right-click on the Volume Maths process and select Open Child Volume, or find the resulting volume directly from the Volume tab (the process volume should be in Italics). Double click on the volume, or right click and select Configure Volume. 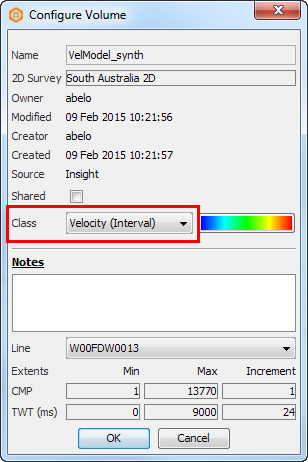 In the Configure Volume window, set the class of the resulting volume to Velocity (Interval). The minimum velocity is 1500; only output the result if it is larger than 1500. The current time sample (twt_ms), as a fraction (0.0 to 1.0) between the water bottom and 9000ms. To scale between two horizons, add another horizon (symbol 'h2') and replace '9000' with 'h2'. Calculate a velocity between 1500 and 6000, scaled by the fraction. The fraction is scaled by 4500. If you have any questions regarding the workflow, or if you need a variation of this process for a 3D model, don't hesitate to contact our support team at support@dugeo.com. Prev: How do I use a velocity volume as time-depth conversion at the well? Next: How do I create a velocity gradient volume?